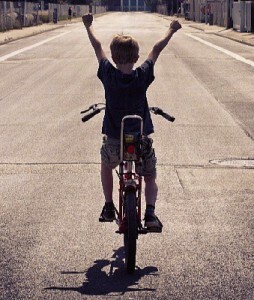 Do you remember learning to ride a bicycle? 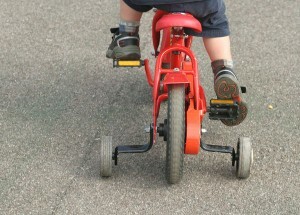 Remember training wheels—those 2 little wheels that got attached to the back of the bike? They afforded you the chance to cultivate your sense of balance, learn to ride the bike, and avoid a crash. Get the image firmly in mind, then… Remember the day when the training wheels came off. For many decades, cosmic configurations in consciousness—matrixes, arcs, ladders, rings of power—have aided humanity in the ascension process. Energetic engineers facilitated their construction. Teachers taught us how to use them. And we’ve used them with great success, these training wheels of ascension. With the New Year comes an invitation, one that will be accepted by a few brave souls. Time to remove the training wheels. Since the recent December Solstice, an experience repeats itself in my meditations: I am somewhere out in space, drifting in the realms of Light (that thing you can do once you learn to still your thoughts). When, suddenly, I have the Oh-my-God realization that the training wheels are off. I look down. Yes, they are definitely gone! Momentary panic. What am I standing on? What is around me? What is going to support me? Rapid-fire questions arise… How do I find my balance with nothing to hold onto? As I don’t have anything to hold onto, how do I maintain balance? What is balance anyway—that thing we are taught to cultivate as we tread the spiritual path? Hmmmmm. Do I really need to balance? Do I really need to be upright and steady? No, not really. I move beyond the concept of balance and needing to be in balance. I enter the flow. I then become the flow. I become fluid and formless, just bopping around in a sea of Light. Naturally, it is still possible to experience form. We can still create and use structures when we need them. We can still reach out and touch configurations in consciousness. It’s not that we need to get rid of the training wheels of ascension. Better that we leave them in place for souls who are just starting to awaken. They may need them. They’re valuable. No, it’s not the training wheels of ascension that need to go. It’s the attachment to the training wheels. When the training wheels come off of the bicycle, you really get the hang of riding. Remember? You can hit the open road, and, for the first time, have that tremendous feeling of freedom that comes as you fly along with the wind on your face. So, the next time you meditate, I invite you to check it out. Do you still need those training wheels of ascension? Or are you ready to fly?